The Arcadia project (using Amigas to drive a dedicated cabinet offering a choice of games) staggered into life at the end of 1987. This story, in ACE in October, is one of the earliest pictures. 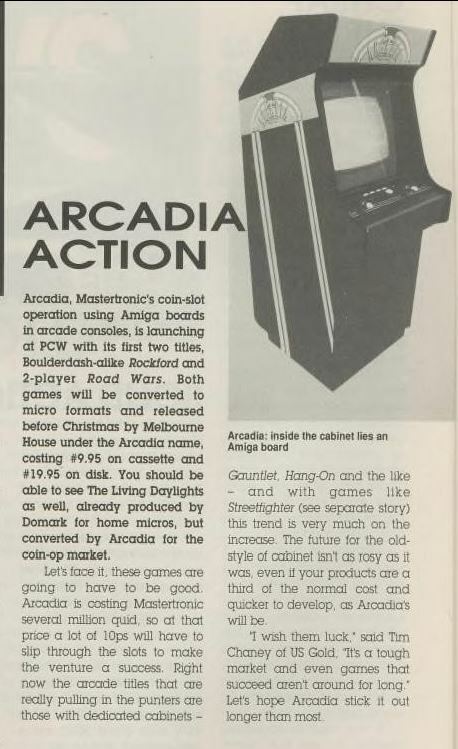 As the report notes, arcade players much preferred dedicated cabinets with customised graphics and the far greater range of sound and visual effects that dedicated chips could produce; unfortunately as Mastertonic had committed to buying thousands of chips from Commodore the project had to go ahead.